rocky's bru: So what's the practical thing to do, Khalid? So what's the practical thing to do, Khalid? Should Taman Tun Dr Ismail residents stage riots, too, to get back their Rimba? After rioting and beating up an on-duty Malay-Muslim fireman half dead (Muhammad Adib transferred from ICU to IJN), the Hindus in USJ now get to keep their temple. Or at least that's the promise made to them by P. Waytha Moorthy. Until a permanent solution over the kuil crisis can be found, the Minister of Unity told a press conference after repeatedly saying he had met earlier with Prime Minister Dr Mahathir Mohamad yesterday. Did Dr M agree to that? 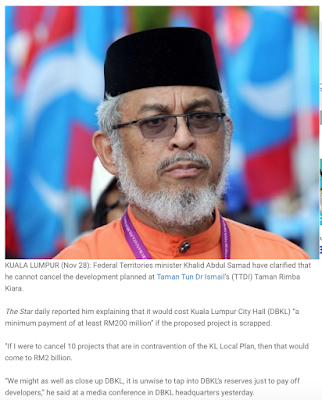 Waytha made the promise despite a court order, the involvement of a public listed company and foreign investors, and even as Adib was fighting for his life ..
Of course, I won't recommend that the TTDI residents stage riots to save Rimba Kiara from being turned into a concrete jungle. The more practical thing to do is to continue engaging Khalid Samad the FT Minister and pray that he would man up. And get your MP, Hannah Yeoh, to play a more active role in defending the park against the developers. She's been awfully quiet. Bro please don’t be racist. Get your facts correct. Who said the Hindus beaten up the Fireman??? MRT: Were we foolish to have wanted, built it?